Welcome. On our site, you will be able to find out information about anything you have ever wanted to know about the structure which holds up the weight of your home. These structures could be made from block, stone, brick, or it could be poured. Regardless of what material it is made out of, it is important for it to be in solid, secure condition so that the structural integrity of the home doesn't have to suffer. There are many things that can go wrong with this area of the home, so it will be important for you to understand as much as you can about these problems and what will need to be done to get them taken care of. We provide information for everything from settlement to bowing walls, and all types of problems in between. 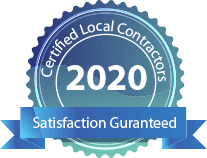 When you have decided that you need professional help for the situation at your home, we can help you to locate a contractor in your community who is licensed, insured, bonded, and ready to work with you. They have years of hands-on experience fixing homes with similar problems to yours, and they work fast and for affordable prices. Take a few minutes of your time to read through some of the more common structural problems that are experienced by homeowners all over the country, and some quick and simple ways they can be taken care of. You can try these techniques on a DIY basis, but if the problem doesn't go away, or if it gets worse, it is recommended for you to fill out our online contact form to locate a contractor in your neck of the woods. What Foundation Problems Are You Seeing? Cracks appearing inside of the home could be a warning sign of a settlement issue. When windows and doors aren't opening/closing like they should, it could be an indication of settlement. You may also notice gaps around the framing. Cracking outside of the home could be an indication of a sinking foundation or it could be from the natural shrinking and curing process of concrete. This could be an indication that the home is settling further and further into the earth. Piers will need to be installed to take care of the problem. 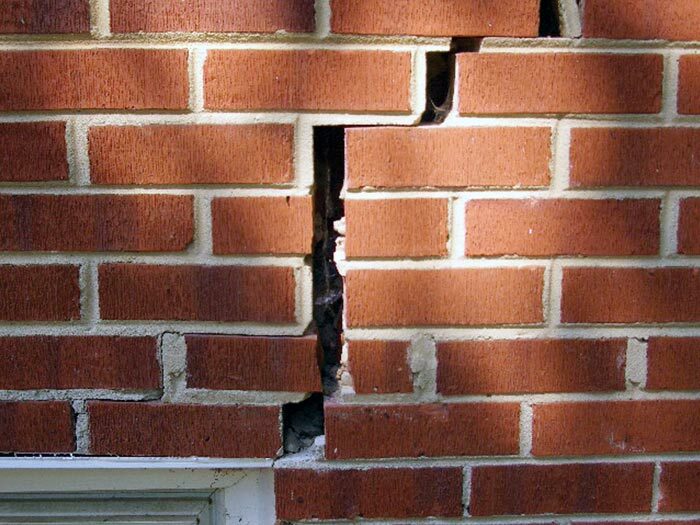 This is one of the most common structural problems seen on homes both old and new, big and small. It can be fixed with the installation of helical or push piers. This is caused from excessive hydrostatic pressure in the soil surrounding the home. 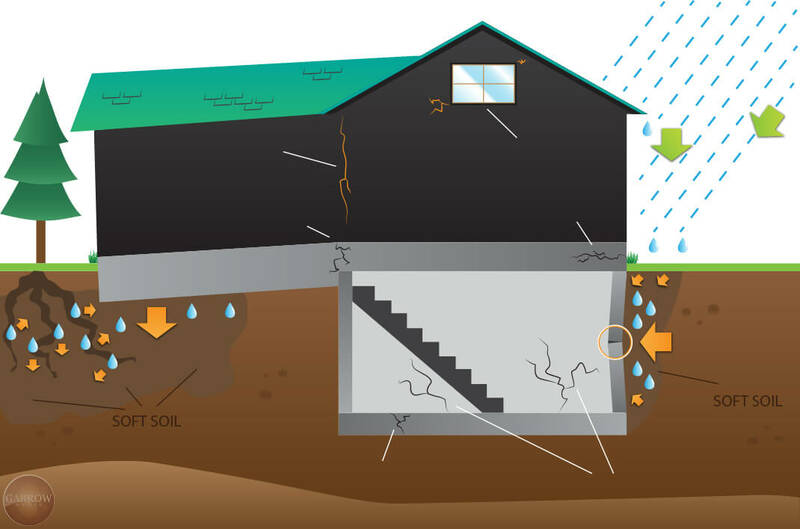 Soil pressure pushes against the basement walls until it proves to be too much and the walls lean into the home. This problem typically doesn't pose a threat to the structural integrity of a home, but it must be filled and sealed before seepage gets inside. This is a common structural problem that is often caused from settlement, bowing walls, or from the natural shrinking and curing process of concrete. 1Foundation Cracks: First, you will need to clean off the surface of the wall so that dirt and debris will not get inside the opening during the repair process. Next, apply a surface sealer. Place a bead of the mixture at the bottom and work your way up and over the crack. Then, you will need to prepare a urethane injection mix and place it into the opening to fill it up. This will help to seal it off so that seepage can't get inside. 2Bowing or Leaning Walls: Be sure that you thoroughly inspect the damage which has already been done so that you know what you are getting yourself into. If it looks too complex for you to handle, contact a professional. When it comes to repairs on your own, you have several options. One would be to replace the wall entirely. Two, you could install beams that are fitted into the wall to help provide it with extra support and stability. You will also need to fill in any cracks that were a result of the damage. 3Sinking Home: For a TEMPORARY fix, grout pumping or mud jacking can be used to stabilize the soils beneath the footing or slab. This can help with lifting the slab and some of the structure itself. This is only a temporary fix, and piers will need to be installed for a more permanent solution.